Thumbs Up: FolkMADS. 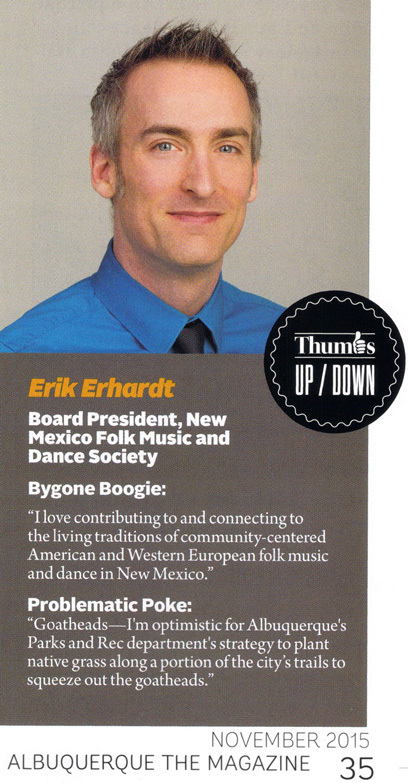 I love contributing to and connecting to the living traditions of community-centered American and Western European folk music and dance in New Mexico, from the English influences from the late 1600s, to the local Rocky Mountain squares from the 1820s, through to the current Modern Urban Contra dances we enjoy each week. Thumbs Down: Goatheads. I’m optimistic for Albuquerque‘s Parks and Rec department’s strategy to plant native grass along a portion of the city’s 170 miles of trails to squeeze out the goatheads and their spiny little seeds. Here’s another option: host-specific, puncturevine eating weevils.